we have posted on the website. If you have an idea or suggestion for a new tip, please send us an email so we can add it for all of our visitors to see. How to deal with the Varicose Veins. No not the ones on the back of the leg! We are talking about those pesky threads that get caught behind the fabric and shadow through to the quilt top. Once the top is on the frame how do you get rid of them? We use the Clover Soft Touch Pick (we will stock them starting in February). The hook is very very small and will slide through your fabric between the fibers to snag that problem shadow line. Once you have pulled it to the surface you can gently pull the tread out from between the layers with a tweezer or your fingers. Simple & effective. One of the services that we provide for customers (for a fee) is the application of binding to their quilts. 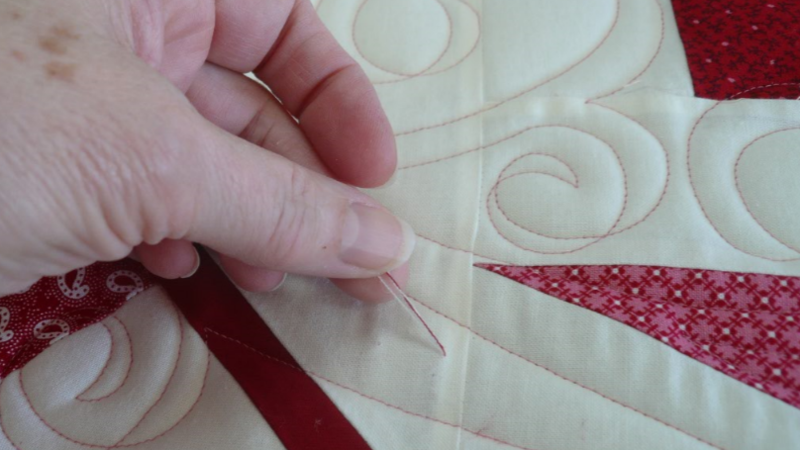 We often machine apply the binding to the front and back of the quilt but will hand stitch the back closure, for an additional fee, if requested. 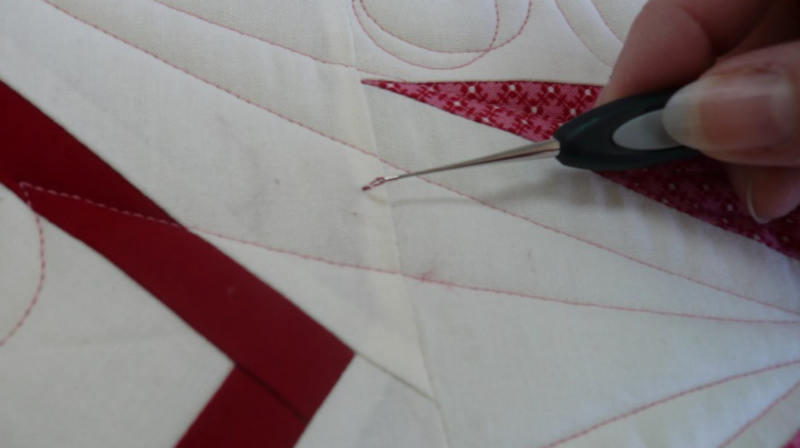 Typically, we use a straight of grain binding unless we are applying binding to a scalloped or curved border. Hopefully this will help you prepare your binding in advance, so it is ready when the quilt is done. So many quilters are rushing to get their quilts done for the holidays. Getting the border on the quilt is usually the last step in the quilt top assembly. Often the pattern tells you what size to cut the borders but what size do you really need? Sometimes the directions tell you to pre-cut all of your fabrics including the borders before you know what size quilt you will finally make. Rarely do any of us have the perfect quarter inch seam that results in a quilt top that is exactly what the math calculates. Our seams are a little off, our cutting is a smidge off. our pressing isn't quite perfect. If you have a quilt that is 5 blocks wide based on a 4x4 layout (like a variable star block) PLUS 6 sashing stripes you now have 30 seams across the quilt before you add the border. If you are off by just a thread or two per seam by the time you have 30 seams you are off by 1 - 2 inches in the measurement for the border. If you pre-cut your border it no longer fits the size of the quilt. 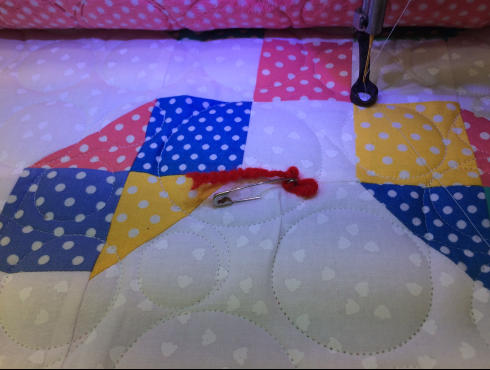 The general recommendation is to measure across the quilt at 3 different points (top, middle and bottom), add those numbers together and then divide by 3 to get the average width of the quilt. By using that average measurement, you will help to minimize the variability in piecing accuracy. Layer two pieces of fabric that are at least that long and cut both the top and the bottom borders at the same time so you know that they are the same length. If possible cut your borders from the length of fabric along the salvage edge. This is the straightest and strongest direction for the fabric and will help to keep your quilt straight and square. If you have to place a seam in the border do NOT use a diagonal seam. That is a preferred method when you have a pattern that needs to match up for corners (think a border print fabric) but the diagonal seam adds bias and 90% of the time it stretches and adds waves or ruffles to your border. Once you have the top and the bottom borders on, measure the length of the quilt in 3 places and calculate the average needed for the side borders. Quick rule of thumb: If you think that you are going to use a fabric for an outside border buy 3 1/4 yards of fabric. You will be able to cut 4 borders that are at least 10" wide by up to 112' long. That allows you to have all the borders cut as a continuous length of fabric that runs along the salvage edge. If you do not need a 10" border then you have fabric to use in the center of your quilt. A recommendation: Cut off enough fabric to make all 4 of the borders and put it somewhere safe. 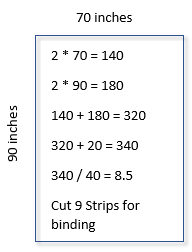 If you want a 6" border cut off 27 inches, if you want an 8" border cut off 36 inches from the LENGTH of fabric. Put a note on the fabric with the name of the quilt you are using it for and put a note on the pattern with directions to where you put the border fabric. From experience I know that you can lose the border fabric.... and have to buy more OR use the fabric that you intended for the border in another quilt....and have to buy more. 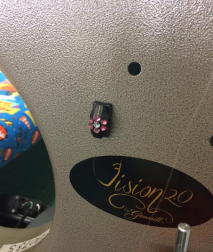 Recently we had a customer who was concerned about cutting fabric because she has problems with her hands and using the rotary cutter. We remembered that there was a Simply Quilts show, from a number of years ago, that focused on Ergonomics in quilting and how to protect yourself from muscular repetitive stress injuries. 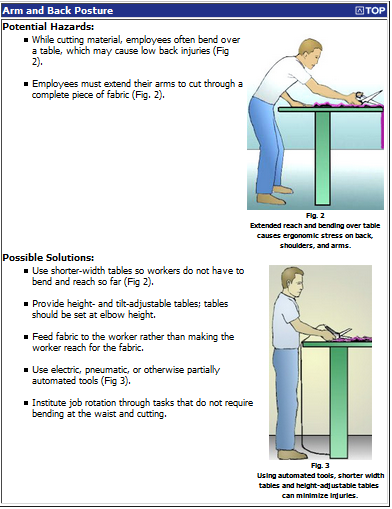 The recommendations for the height of your cutting mat was 3-4 inches below your bent elbow. This maintains your posture and allows you to reach across the folded width of your fabric. Typically the height of the kitchen counter is a good working height for most quilters. The standard countertop height is 36" while the dining table or desk height is 30". The lower height causes you to lean forward while cutting and to have your hand in the wrong position. The solution can be as simple as using the countertop when doing a significant amount of cutting. However, most countertops are not deep enough for the 24" X 36" cutting mat. An alternative is to place a half inch of plywood on top of large vegetable cans or even over two of the popular plastic storage bins. Anything that brings the cutting mat up to height AND provides a stable base. For safety reasons, there should be no wobble or instability in the cutting surface. That same day, Page had a quilt that she was doing some ripping on (yes we do rip out quilting when there is an error). Page adjusted the height of the quilting machine to a better height for her. The relief on her back and shoulder was immediate. Keep in mind that your shoes make a difference. If you adjust the height of the cutting mat when wearing flip-flops, you will find the cutting level too low in the fall when wearing tennis shoes. Avoiding injury starts with planning your workspace and managing your time and tools. Mistakes happen! OK, we know you never have these problems but we do. How do you mark where there is an issue so you know where to go back to? If you are not going to fix the problem right when it happens either you need to remember where the issue was OR have a way to identify where to look. We use 4-5 inches of RED yarn tied through the coil of a safety pin. We actually have a dozen or so Red Flag pins read to use whenever they are needed. This is an ongoing debate for many quilters. Many of us have worked in quilt shops and fabric stores over the years and now we are seeing the quilts at the finishing stages and sometimes in a "I need some help" stage. The dying and manufacturing of fabric has certainly come a long way in recent years. Our fabric selection is limited only by our imagination ... somebody out there has what you are looking for. From hand-dyed to batiks and printed fabrics, the quality and colors are amazing. However, buyer be aware, we still have problems with fabric dyes bleeding and running, particularly with the reds, purples and deep blues. A number of years ago Harriet Hargraves had information cards regarding the testing of fabric for bleeding. One of the items that caught my eye was that the fabric by itself may be very stable but when put next to another fabric, or left sitting in a wash machine after washing, may bleed into other fabrics that it comes into contact with. 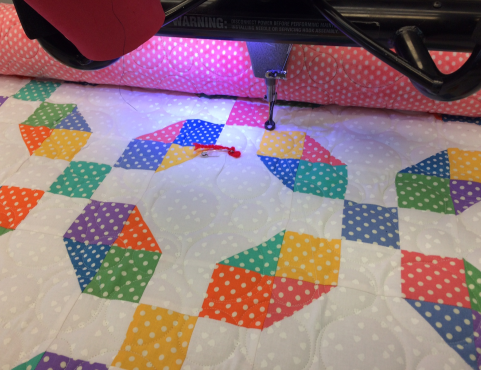 Often quilters do not want to pre-wash their fabrics because the new finish makes it easier to cut and maintains the shape during the piecing process. Pre-washing usually needs a good pressing with starch to get the wrinkles out and gives the fabric more body during construction. Because cotton based quilting fabrics do shrink some, to a lot, when washed it is generally better to either pre-wash all fabrics or none of the fabrics. When you pre-wash all of the fabrics (including the backing) you take most of the shrinkage out during that initial wash and drying cycle. When you do not pre-wash any of the fabrics you will likely get a more consistent shrinkage across the quilt than when some have been washed and some have not. If you like and appreciate the soft puckery look of the washed quilt, do not pre-wash your fabrics. If you prefer a smoother flatter look to the fabrics, even after washing, then pre-wash everything. If you are working with all pastels, bleeding should not be an issue. If you are working with a lot of medium to dark tones of hand-dyed fabrics, particularly when mixed with light backgrounds, pre-washing some test strips might be to your advantage. It should be noted that many of us do have a lovely pink quilt that did start out as red & white. Not what we planned but lovely just the same. 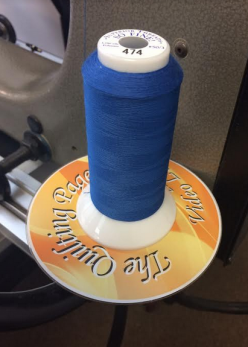 A trick that we use for our thread stands is to remove the three metal "wings" that are attached to the thread spindle and then place an old CD on the spindle. That allows the spools of thread to sit flat on the CD and keeps the thread from puddling around the base of the spindle. The other thing that we do is to place a thread cutter on the side of the machine body close to where the spool of thread is placed. 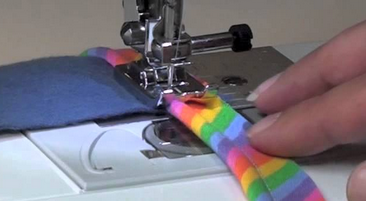 This makes it very easy to cut your threads without having to hunt down a pair of scissors. They have the cutting edge protected so they are safe for your fingers and there is no magnet so it is safe for your machine. These "Line Cutterz" come with an adhesive back to stick right on the machine. 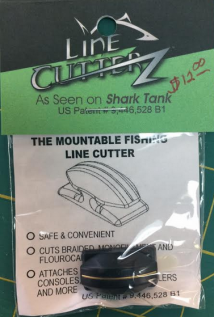 We have seen them available through Brewers - but they are backordered a lot, I bought the crystal-gemmed version at the Paducah show and we found an online source of "Line Cutterz" used for fly fishing lures. We have some in the studio for sale. Are you thinking you really need to do something with all of that leftover or “why did I buy that” fabric stash? I was overwhelmed by tag end fabrics of quilts gone by and fat quarters of fabric I just had to have at one point. I considered getting really organized a la Bonnie Hunter but then realized that I wanted to put my creative effort into other designs. I really wanted to make this fabric disappear but with a purpose – donation quilts and as many as I could make so it had to sew up quickly. There are thousands in Minnesota who would appreciate and need a quilt to keep them warm in our cold winters. The Log Cabin quilt has been a staple of the frugal quilter for generations. A simple quilt with clean straight seams that contrasts light with dark fabrics to create a multitude of different and visually pleasing designs just by turning the block. I remembered a quilt “class” that I took 35 years ago that was a Log Cabin made out of 2 ½ inch strips and how fast it went together. Most books will say that at 2 ½ inches you lose design options with the 14 inch finished blocks (they really like 1 to 1 ½ inch finished strips) but I was not worried about design options I wanted fabric used. So I went to my many boxes of fabric and leftover chunks and started cutting 2 ½ inch strips – a pile of lights and a pile of darks. I focused on the blue fabric box and picked fabrics that were of a similar personality– no brights or pastels or pretty multicolored florals. Then I cross cut the strips into “logs” for each of the sizes needed. 8 ½ inch light 8 ½ inch dark Yes, I am a geek! So I use up more fabric with the 2 ½ inch strips BUT I need a lot more blocks of the smaller strips to make a quilt of equal (or close to) size. I have gone from a 14 in block to a 10 ½ inch block. I actually use more fabric (more seam allowance and more blocks) using a 2 inch strip for the same sized quilt. The long and the short of it is: with the larger blocks and pre-cut strips sitting in a box, I can make a quilt top in a day. I use a little less fabric but I save time in sewing fewer blocks and get a nice sized quilt top completed. P.S. Since I ran these calculations I have decided to make my quilts 5 wide by 6 long so the top finishes at 70 by 84 which is better for a twin bed size. Lincoln Place is part of The Link system in the metro area that offers shelter apartments for homeless young adults (ages 18 – 24) who have very little. Your scraps and unused fat quarters can make a special Holiday gift and offer warmth to people who are often invisible and in need. So grab your rotary cutter and start making log piles to make a quick and useful “eat the stash” quilt that you can complete in a weekend. 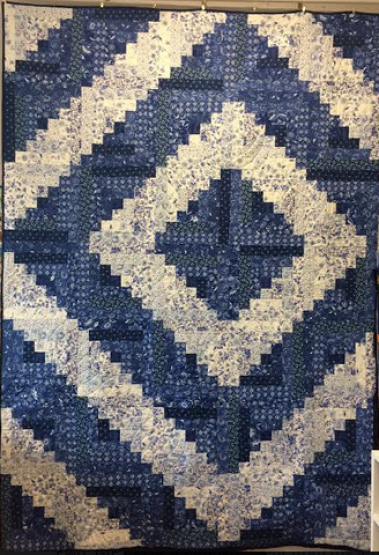 Likewise, if you want to donate a quilt top or finished quilt through us, Dee Legvold is coordinating the collection at the studio and we will make the donation prior to Christmas. Once we have the quilts collected and submitted to The Link we have a signed statement from The Link for the tax value of the quilt.